What technology stack does your team use to enable growth? seo – google search. find how you can beat your competitors by building a better product. e-mail – sendgrid with dedicated IP. make it sure you have optimized your website -> email newsletter flow. lots to be done there and that’s important for growth. seo - google search. find how you can beat your competitors by building a better product. e-mail - sendgrid with dedicated IP. make it sure you have optimized your website -> email newsletter flow. lots to be done there and that's important for growth. I found this very simple one very useful. I remember reading this online somewhere. 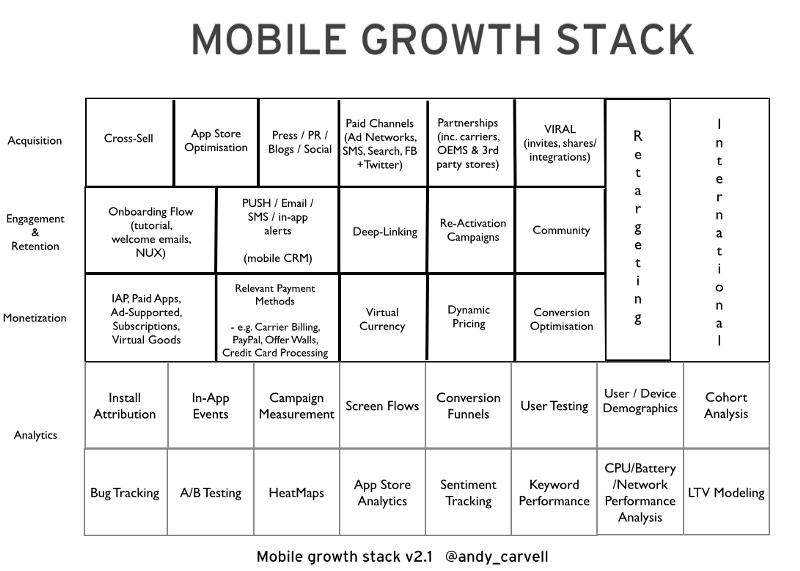 Well one of the best charts I have seen is this to understand the Mobile Growth Stack. This is copied from Andy’s Carvel’s blog here. In terms of tools following are some picks. Not an exhaustive list. Just a starting point. This is copied from Andy's Carvel's blog here. Thank you for all the amazing advice. I especially like the chart from Andy’s Carvel’s blog and I wanted to share his latest “revised” marketing stack. I took a look at Branch and I’m impressed with all the features they offer. We’re really keen on the smart banner and deep linking though to install. After poking around, I found their YouTube channel, here. It has a lot of their Meetup recordings and walk-through guide on implementing several features. Its interesting Mike Also quoted him above. I think there are few more great pieces on this topic, let me dig out some more. Thank you for all the amazing advice. I especially like the chart from Andy’s Carvel’s blog and I wanted to share his latest "revised" marketing stack. I took a look at Branch and I'm impressed with all the features they offer. We're really keen on the smart banner and deep linking though to install. After poking around, I found their YouTube channel, here. It has a lot of their Meetup recordings and walk-through guide on implementing several features. Here is a great post by Greylock partners based on growth meetups they do in Silicon Valley.